. 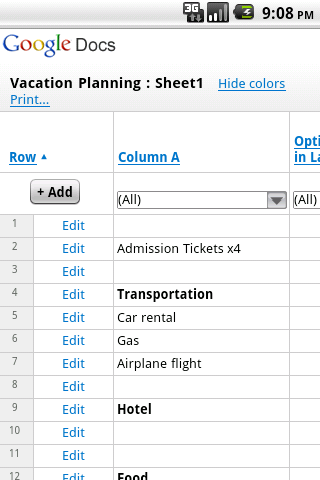 Today, we’re extending that functionality to mobile spreadsheets and adding some additional printing improvements to the desktop version of Google spreadsheets. Now you can print your spreadsheets to any cloud-connected printer right from your phone by selecting Print... underneath the spreadsheet title. This feature will work on most phones and tablets that support HTML5, such as devices running Android 2.1+ and iOS 3+. We’ve added a number of printing options, including spreadsheet titles, sheet names and page numbers. You have control over which of these you want to print. We hope you enjoy these improvements to printing. 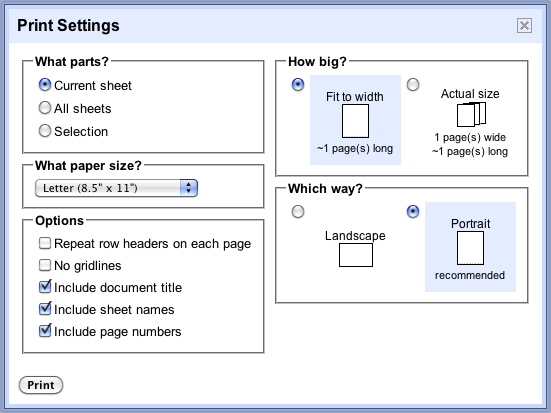 In January, we added support for Google Cloud Print to mobile documents. Today, we’re extending that functionality to mobile spreadsheets and adding some additional printing improvements to the desktop version of Google spreadsheets.